01: Combination coach/baggage car. Built circa 1889 by John Hammond & Company. Acquired by McCloud River before 1906 (Likely 1897). Seats made of bamboo strips cemented onto canvas. Originally equipped for steam heat. Reclassified as an outfit car 1/1939. Retired 1964 and donated to proposed railroad museum to be located near Dunsmuir. Currently part of Railroad Park Resort dining facility. ?? : Combination coach/baggage car. Purchased or built by the railroad in the first years of operations and retired 1906. Valued at $750 on a 1906 inventory. 02: Purchased new from Hicks Locomotive & Car Works 10/1907. Cost $6299.19. Had two compartments (one smoking, one non), double windows, lead glass overhead trim. Retired 8/1936, then restored 1/1939 as an outfit car. Retired 9/1941. Body removed from trucks and placed on ground to become dwelling for carman assigned to mill pond repair-in-place track. Body burned in 1952 to make room for new log pond. 03: Built in McCloud car shop 11/1912. Cost $3841.91. Car re-built with cupola 3/31/1930. Converted to a caboose 1/1939. Retired 7/1945. 100 (1st): Private car of J.H. Queal, who president of the McCloud River Railroad and McCloud River Lumber Companies. Acquired new from Hicks Locomotive and Car Works 1907. Traded to Pullman for 100:2 in 5/1913. 100 (2nd): Private car of J.H. Queal, who president of the McCloud River Railroad and McCloud River Lumber Companies. Acquired new from Pullman 5/1913. Sold to Union Pacific 11/1921, following Queal's death. Retired and scrapped 7/1956. 501, 502: 52-foot flats, former Atchison, Topeka & Santa Fe #2563 and #2565. Both cars acquired by McCloud River from Botsford (equipment dealer) in November 1956. #502 coverted from work to passenger flat by 1958 and retired circa 1980; #501 converted from work to passenger flat circa 1962, then converted back to work flat circa 1980. Car served as tender to Burro crane #1851 until both deeded to Great Western Railway Museum around 1987. Scrapped in McCloud in the fall of 2010. 1015 (02), 1803 (01), 1949: "Harriman" style 60-foot commute coaches, leased circa 1964 from the Southern Pacific and then purchased during the summer of 1966. Click on link for pictures and history. 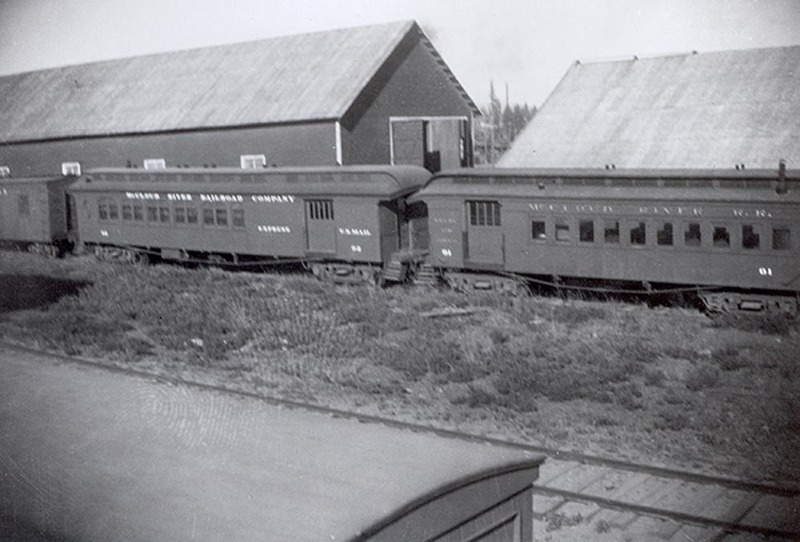 Railbuses #50 and #52/#63: The transition to stationary log camps meant that the lumber had to transport loggers ever increasing distances to and from work each day. Around 1940, the company built a pair of railbuses to handle this chore. Railbus #50 consisted of a large passenger compartment mounted to the frame of a GMC truck chassis which had been modified to run on rails, while the #52 (later renumbered 63) resembled a modified McKeen car. The Pondosa shops built the #52 around a CAT 60 engine. #50 generally worked out of White Horse, while the #52 worked out of Pondosa and then Kinyon. The deteriorating remains of the #52/#63 are still present at the site of Kinyon. 824: 50' flat, converted from maintenance flat in 1994. Scrapped June 2011, with body sold for re-use to a buyer in the Chico, CA area. 826: 56-foot flat, likely ex-SP. Converted 1995 from a maintenance flat; double deck added 1997. Car remains stored in McCloud in 2012. 827: Probably converted from McCloud maintenance flat #820 in 1995. Scrapped June 2011, with body sold for re-use to a buyer in the Chico, CA, area. 1713: Kitchen car, constructed in 1997 in the McCloud shops using an ex-NOKL bulkhead flat #212203. Sold and moved to Burney in October 2016. McCloud Railway Coaches: Five ex-VIA Rail passenger cars. SCRX #6203: Privately owned passenger coach SCRX #6203 has been a fixture in the McCloud for years. The car was originally ACL Cooper River, an ACF 14 Roomette - 2 Drawing Room sleeper. It was reconfigured in 1961 to a 7 Double Dedroom - 2 Drawing Room and renamed Jay Bird. When the car was acquired by Seaboard Coast Line it was given the number 6203, retaining the Bird name. The care later became Amtrak #2303 and was retired in 1982. The car may have been used in movie work prior to coming to McCloud.